Each picture book in the Lima Bear Stories series delivers messages for children to help them handle everyday situations with siblings and friends, including tolerance, honesty, and courage. Basic characters, each with their own distinct personality, appear and reappear throughout the series, allowing children to get to know them and anticipate how they are likely to act in different situations. Extended learning and activity questions are included to allow parents and teachers to further encourage children to become involved in the concepts presented. In the kingdom of Beandom, Bully Bean is feared. He plays mean tricks, makes fun of other beans, and puts them in danger. Lima Bear, the only bean with green fur who is always helping others, seems to be Bully Bean’s favorite bean to pick on. But what happens when Bully Bean is in danger? Will Lima Bear and his friends run away, or will they rescue him? Bully Bean expects the worst, but Lima Bear knows that treating others with kindness is the right thing to do, even though Bully Bean has bullied him for a long time. 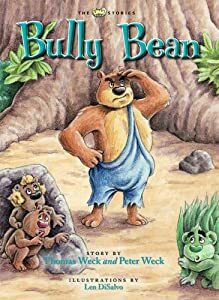 Lima Bear soon returns with a large group of friends to help rescue Bully Bean, who learns to use his large size to help with tasks in the Kingdom rather than be hurtful. This story is about a bully. There have been many stories on the news and in our newspapers concerning bullying in our schools and neighborhoods. I feel this book could assist parents into a safe discussion in their home about bullying. What I really liked about this story was way in which the characters who were being bullied, forgave the bully and helped the bully. Bully Bean realizes his error and becomes a good friend and a contributor to the community. The Weck authors have written a story which illustrates not only the issue of bullying but also a positive way that we can help our children through the challenges of dealing with a bully.